People experience greater empathy and practical support following bereavement than at any other time of their life. 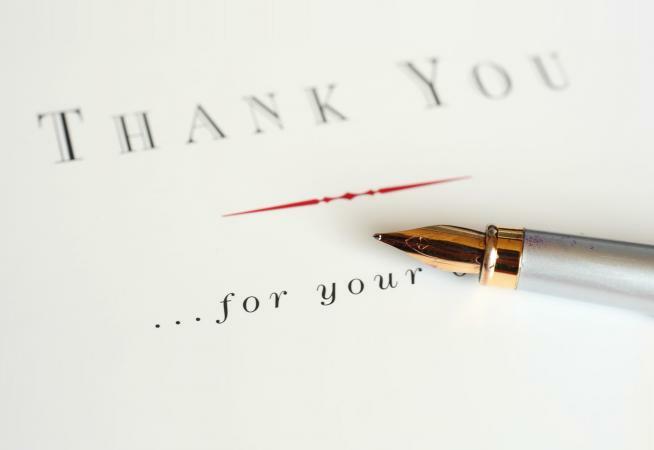 Sending a thank you note after a death is a traditional part of funeral etiquette, and it is a kind way to communicate that you appreciate your fellow mourners and their attendance to the funeral. Sending thank you notes after a death is a gesture that can mean so much, not only to the person sending the notes, but also to the recipients. The time immediately following a funeral is a time for calm and reflection, and not everyone feels organized enough to contemplate the organization of passing on thanks. It is logical and only right to thank people for gifts, cards, charitable donations and practical acts of support, but for some it is as important to thank someone for the meaningful and much appreciated psychological support they offered. It is true that in times of sadness and distress, words can be far more comforting than material offerings. Putting pen to paper to write a personal thank you card may seem like a chore to most individuals. However, there are healing benefits to sending a thank you card or letter. Acknowledging your appreciation of others is therapeutic for you and the person receiving your words and may help reinforce bonds of friendship and reciprocate feelings of support. In addition, as you consider what to say in your note, you will revisit the positive responses of friends and family and affirm their efforts to comfort you and others while also paying their respects to the deceased. Having gone through the upsetting motions of making complex funeral arrangements, often the last thing on a person's mind is to send out cards or notes of thanks to fellow mourners and well-wishers. The etiquette of sending thank you cards suggests that this should be left no longer than two weeks after the funeral. If left longer than this, the gesture tends not to have the same impact. As the process of conveying thanks after a funeral is such a popular tradition, there are various options available as to the methods of passing on thanks. TinyPrints has memorial thank you cards that you can order in numbers as few as ten or higher. Amazon has an array of funeral thank you and sympathy acknowledgement notes. The Stationary Studio offers a selection of customizable funeral thank you note cards. The practice of making a homemade card is growing more popular. Not only is it an incredibly sentimental gesture, but it also may help keep you busy doing a productive task to help with the mourning. Blue Mountain offers printable sympathy thank you cards. You can also find card making supplies at most stationary and craft stores, such as Hobby Lobby or Michaels. Choosing quality stationary when sending your thank you note is not obligatory, but pretty paper will only enhance your message and make for a nice keepsake. The shopping experience and creation of your cards may also help you in your grieving, as you busy yourself with the task. Consider taking a friend or family member to your favorite store to purchase the essentials. In this modern age, it is not unheard of for a person to send their message of thanks as an e-card. This method allows the individual sending the message of thanks, the option to send it to multiple recipients. For a person with a large family, social network, or peer group to whom they must convey thanks, this method is not only thoughtful, but practical too. Smilebox offers generic thank you cards you can personalize with a photograph. Gratefulness.com offers a selection of more than 900 thank-you e-cards, including blank cards that can be entirely personalized. Don't create more stress for yourself. The action of sending the cards is, for many people, an uplifting action. Therefore, many people like to include everyone in that act. Most importantly, remember that guests and those who were there to support you do not expect any kind of gratitude, especially in written form. If you do not think you can offer the thank you card or note within a reasonable period, then it is best not to do it at all. Nobody will judge you negatively for it. Do what is right for you. When sending a note of thanks, it can at times be difficult to express your feelings in a way that truly justifies them. In your note, it is important to mention specifically what you are actually thanking the individual for. If they sent you flowers, then mention that in the note, and explain how the flowers made you feel, and how they helped you cope during the difficult time. To personalize your thanks in this way, not only adds a greater sentiment to the act, but it also adds to the recipient's feeling that they have supported you through a difficult experience. I appreciate your time and sacrifice (for those who have traveled far, taken time from work or have made other sacrifices to attend the funeral). Your presence was a great comfort to me. It was good to see you, even under the adverse circumstances. Thank you for honoring (name of loved one who has passed) by attending the funeral. I was pleased to see you. Your participation and service in the funeral was a great help. You were such a blessing. Thank you for your support and thoughtful words in this difficult time. I enjoyed our conversation. It meant a great deal to me that you came. In some cases, you may wish to further personalize the note by sharing personal anecdotes about times the person you are thanking shared with the deceased. For example, you might say, "(The deceased) shared with me how much he appreciated your friendship. I enjoyed hearing the stories he shared about your time as college roommates." If these anecdotes seem natural and you'd like to share them, the recipient will greatly appreciate the memory. Bereavement verses are often used in condolence letters and cards given to the mourners. You can include special verses, including poems, Bible scripture and other prose to convey your support to those you want to thank. This is especially important when sending a note to a dear friend of the deceased or loved one to whom he shared a connection. Typically, you should aim to send your thank you notes a few weeks after the funeral. However, if you are overwhelmed with your grief and do not have the strength to send out notes, you might consider delegating the duty to another family member. If that is not an option, and you feel unable to send a note, remember that it isn't required. Do what will best facilitate your grieving process and support your healing.